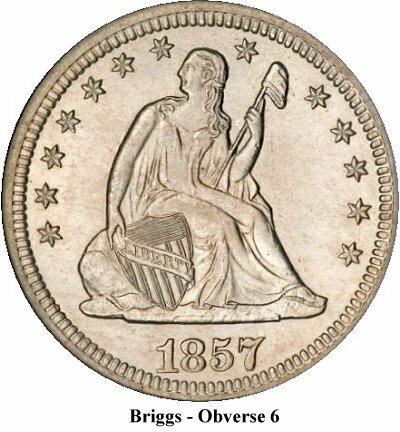 The 1857-O quarter is a very interesting issue for variety collectors. The total of 10 die pairings cataloged in “The Complete Encyclopedia of United States Liberty Seated Quarters” represents enough distinct coins to present a challenge, but not so many as to make a complete die marriage set unattainable. Three of the die pairings appear to be very rare, including the elusive obverse with “18” in the denticles. Three of the die pairings are common within the context of o-mint seated quarters. This month we will look at the 1857-O “low date” variety, comprising two of the die pairings in the middle group that is neither common nor extremely rare. The 1857-O low date variety consists of coins struck from a single obverse die (Briggs’ 6) paired with two reverse dies (Briggs’ B and C). The variety is an obvious one that can be easily attributed without magnification. This particular die has the lowest date position of any of the large date seated quarters. When the logotype was decreased in size later in the series, it became possible to locate dates even further from the rock than on the 1857-O obverse 6, but up to that time this die represents the lowest date position seen on a seated quarter. The date nearly touches the denticles as shown in Figure 1. Reverses B and C (Figures 2 and 3) are identified by mintmark positions with reverse B having a mintmark left of the crotch and touching the feather, while reverse C has a mintmark centered in the crotch approximately equally distant from feather and olive branch. The 1857-O as a date and mintmark is a scarce coin that becomes very scarce and rare in almost uncirculated and mint state grades, respectively. Over the past few years, the low date die pairings have been available periodically in low to medium circulated grades, but very seldom seen in high grade. Population data for NGC and PCGS indicate that the two services have graded a total of 121 examples in all grades, 33 of those are mint state coins, and 58 are in the AU grades. 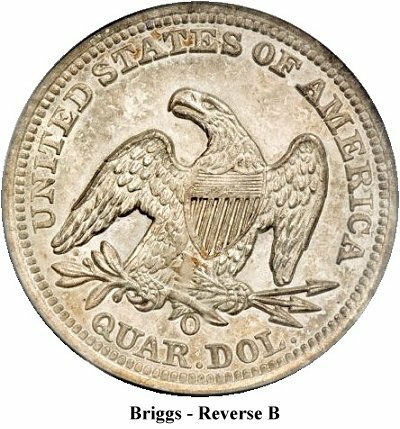 Larry Briggs, in The Complete Encyclopedia of United States Liberty Seated Quarters, states that the ’57-O is R6 (13-30 known) in mint state and R4 (76-250 known) in XF/AU. A detailed examination of the Heritage auction archive shows that they have offered 55 unique examples of the ’57-O quarter since 1/1/1999 (when they began archiving photos). A total of 44 coins were in problem free grades and 11 more with significant problems noted were offered. Only 6 of the 55 coins featured the low date obverse die illustrated above. 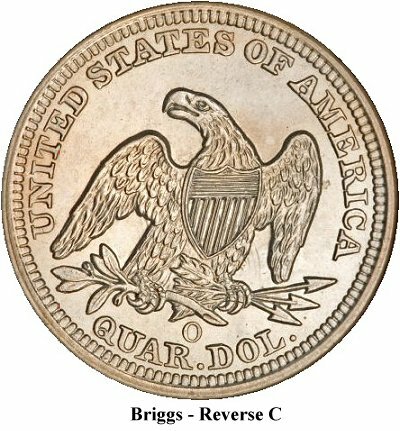 Two of the 6 low date quarters had obverse 6 paired with reverse B and the remaining 4 were paired with reverse C. The only problem free 6B example was in a SEGS holder graded XF45 and sold as part of Larry Briggs’ reference collection in 1999. The other 6B coin was an XF details piece with reverse damage sold as part of the Jules Reiver collection in 2006. The 4 examples of die pair 6C in the Heritage archive include an F12 cleaned coin holdered by SEGS and sold as part of Larry Briggs’ reference collection in 1999 in one lot with five other seated quarters including the 6B coin mentioned above. Interestingly, of the three remaining 6C coins all were problem free and two were mint state – one an NGC MS64 and the other a PCGS MS62. It does appear that, even in lower grades, the 6C die pair is more available than 6B. The highest graded 6B coin seen has been an XF45.